Protect your vehicle with our free Lifetime Protection Plan. If you’re like most people, your vehicle is a significant financial investment. You want to do everything you can to protect that investment and ensure that it gives you continuing reliability, safety and performance for many years to come. 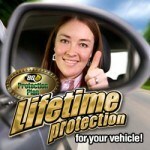 Sil’s Auto Centre can help with our free Lifetime Protection Plan. It’s easy to enroll your vehicle in our free Lifetime Protection Plan. Simply bring your vehicle in to Sil’s Auto Centre for any of our Lifetime Protection Plan fluid maintenance services. Our Plan covers six of the primary systems in your vehicle (Transmission, Engine, Brake, Power Steering, Cooling and Drive Line). The Plan protects your vehicle for the system in which you’ve had the qualifying service performed on, for as long as you own your vehicle and continue to maintain it with the proper service intervals. As an added bonus, the Plan is transferable if you sell your car. For vehicles with mileage of 0-60,000 kilometers at first service. Coverage begins immediately after service is performed. For vehicles with mileage of 60,001-120,000 kilometers at first service. Coverage begins 800 kilometers after service is performed. For vehicles with mileage of 120,001+ kilometers at first service. Receive the cost of prior services off of future related repairs. Services must be performed at Sils Auto and must be performed at the proper intervals to qualify. Call and ask our Service Advisor for details. Click here for complete terms and conditions of Plan 1 and Plan 2.